During the late nineteenth and early twentieth centuries, the United States pursued an aggressive policy of expansionism, extending its political and economic influence around the globe. That pivotal era in the history of our nation is the subject of this online history. After temporarily resolving the problems of Reconstruction and Industrialization, Americans began to resume the course of expansion. The horrors of the Civil War had interrupted the original Manifest Destiny that began in the 1840s. Now, as pioneers settled the last western frontiers, expansionists looked yet farther to the west—toward Asia and the Pacific. A leading expansionist, Captain Alfred T. Mahan, cautioned that the Pacific could "be entered and controlled only by a vigorous contest." 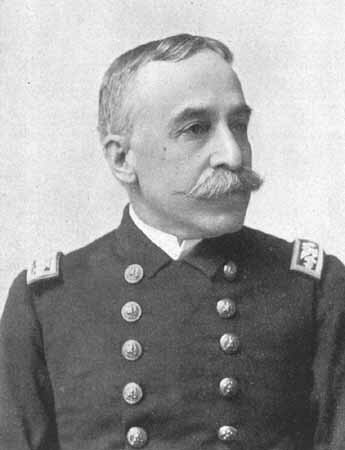 As head of the Naval War College, Mahan believed that America's survival depended upon a strong navy. He argued that a strong navy would require island possessions to serve as naval bases. The time had come, Mahan wrote, for Americans to turn their "eyes outward, instead of inward only, to seek the welfare of the country." Kayama Yezaimon, daimyo of Uraga, raced to the battlement, the clash of the warning gong still ringing in his ears. Stopping beside the brass cannon that guarded the entrance of Edo Bay, he scanned the horizon. The summer sun flashed high above the blue Pacific, and beneath it four ships approached with the tide. Kayama scowled. Through a telescope he studied the ships, which were well beyond the range of his small shore batteries. The ships bristled with cannon much more formidable than his own. Identical flags flapped at the stern of each vessel—red and white stripes, with white stars on a patch of blue. Kayama barked out an order. A samurai ran forward and dropped to one knee. The daimyo instructed the samurai to ride to the castle of Abe Masahiro, and to inform the shogun that a barbarian fleet blocked the mouth of Edo Bay. From the fo'c'sle of the sloop of war Saratoga, Lieutenant John Goldsborough watched as dozens of Japanese galleys approached the American fleet. They were all fantastically decorated with flags and banners. They were propelled by from ten to twenty oars each with generally two or three men at each oar. None of the boats were permitted to come alongside any ship in the Squadron, though they all appeared quite anxious to go alongside the Flagship. Still none were permitted until we were fully convinced that a high officer was in one of the boats. Then he alone, with an interpreter who spoke Dutch, was allowed to come over the Susquehanna's side. On board the Susquehanna, Commodore Perry's aide, Lieutenant Contee, informed the official that the Commodore carried a letter from the President of the United States to the Emperor of Japan. The Commodore intended to deliver the letter personally to an official representative. Since the Commodore was of the highest rank in the United States Navy, Contee said, he would meet only with a Japanese official of equal status. Two days later, Kayama Yezaimon visited the Susquehanna. He informed Captain Adams that the Americans must take their message to Nagasaki. Perry refused to meet with Kayama, but he wrote a message. After several more days of haggling, a suitable representative, "Prince" Toda, arrived in Uraga. With cannon salutes and a marching band, Perry led a parade of marines to meet the Japanese delegation. He presented Toda with the president's letter, enclosed in a rosewood box trimmed with gold, and announced that he would return for the emperor's answer in the spring. In February 1854, Perry returned to Edo with eight ships. He accepted the favorable reply to Fillmore's letter and visited several Japanese ports before beginning the long voyage home. His diplomatic mission had officially established the United States' presence in Asia. Still, the Americans never realized that they had been negotiating with a mere shogun. For the emperor to consult with barbarians was unthinkable. As ships crossed the vast ocean to trade in Asia, islands in the Pacific became important stops for coal, provisions, and repairs. In the South Pacific, the American navy negotiated with awestruck natives for the rights to build bases on the islands of Midway and Samoa. 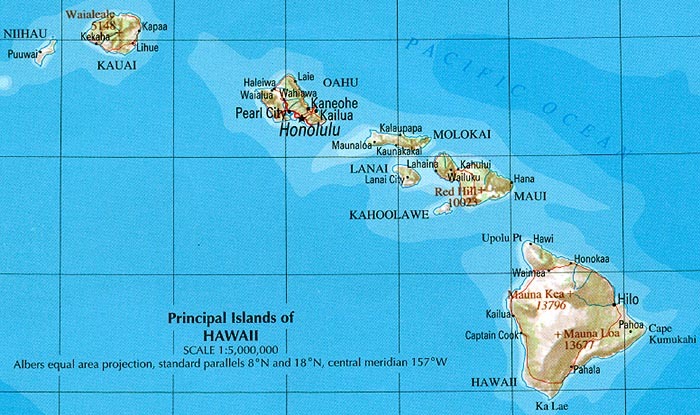 The Hawaiian Islands, which lie closest to the American mainland, had long been an important stop for the Pacific fleet. Pearl Harbor, on the island of Oahu, offered one of the most attractive natural bases in the Pacific. In the early 1800s, missionaries from New England made the arduous voyage to Hawaii and settled there. They sent back news of fantastic economic possibilities in the islands. Soon other Americans followed to become sugar planters and to establish profitable businesses. The ease with which the Hawaiians on their own land can secure their food supply has undoubtably interfered with their social and industrial advancement. . . . [It] relieves the native from any struggle and unfits him for sustained competition with men from other lands. The fact that food is supplied by nature takes from the native all desire for the acquisition of more land. Today's food can be had for the picking, and tomorrow's as well. Instead of grasping all he can get, he divides with his neighbor, and confidently expects his neighbor to divide with him. While the Kanaka were content to live in their traditional, idyllic ways, Americans were busy building huge plantations, warehouses, railroads, drydocks, banks, hotels, and stores. They soon dominated the island's economy, and they were able to influence its government as well. Americans created and controlled Hawaii's legislature and cabinet, and they limited the power of the native king. As the nineteenth century drew to a close, disputes arose between the Kanaka and those of foreign descent. "Hawaii for Hawaiians" became the slogan of people who sought to restore the traditional ways of the kingdom. Others called for the annexation of Hawaii by the United States. Annexation would eliminate the recent trade restrictions on sugar and revive the island's faltering economy. Secret organizations, such as the Annexation Club, plotted revolution. In the midst of this unrest, Queen Liliuokalani assumed the throne upon the death of her brother, King Kalakaua. At age fifty-two, Liliuokalani had already governed the islands as regent during her brother's long absences. She was well qualified to take control of the government. An American newspaper reporter who interviewed the new queen described her as "strong and resolute. Her manner was dignified, and she had the ease and authoritative air of one accustomed to rule." Educated in American schools, Liliuokalani's voice "was musical and well modulated, and she spoke remarkably pure and graceful English." Islanders who favored annexation hoped that the new queen would support their interests. Liliuokalani, however, was determined to eliminate American influence in the government. She tried to create a new constitution that would strengthen the traditional monarchy, but her cabinet refused to cooperate. The American residents were outraged. They organized the Committee of Safety and appointed members of the Annexation Club as its leaders. On the morning of January 17, 1893, armed members of the committee attacked. They took over the government office building. From its steps they read a proclamation abolishing the monarchy and establishing a provisional government. The provisional government "would exist until terms of union with the United States of America have been negotiated and agreed upon." Sanford B. Dole, an elderly judge with a flowing, white beard, became its president. Hawaiians who were loyal to their queen tried to come to her defense and stop the revolution. When they arrived in Honolulu, however, American troops confronted them. The United States' minister, John L. Stevens, had sent for a battalion of marines and an artillery company from the cruiser Boston. They were ordered to protect the provisional government. For the Hawaiians, resistance was hopeless. Queen Liliuokalani sadly surrendered her throne. She wrote a document in which she "yielded to the superior forces of the United States." She pleaded with the U.S. government to "undo the actions of its representatives and reinstate me in the authority I claim as the Constitutional Sovereign of the Hawaiian Islands." Meanwhile, the Provisional Government sent five representatives to Washington to apply for annexation. They quickly drew up a treaty, and President Harrison signed it and submitted it to Congress. Before the Senate could approve the treaty, however, a new president took office. This president, Grover Cleveland, had reservations about taking over an independent country. He withdrew the treaty and sent a special commissioner to Hawaii to investigate the revolution. The commissioner reported that Minister Stevens had conspired with a small group of revolutionaries to overthrow the government. Cleveland replaced Stevens with a new minister and tried to restore Liliuokalani to the throne. President Dole flatly refused to give the government back to the Hawaiians. He told President Cleveland that the United States had no right to meddle in Hawaii's internal affairs. Congress agreed, and it adopted a "hands off" policy toward the island. Dole's new government then created an army and held a constitutional convention. On July 4th, 1894, the government unveiled the completed constitution and declared an independent Republic of Hawaii. Despite Liliuokalani's pleas for help, other governments quickly recognized the new republic. In desperation, supporters of the queen began to collect weapons and to make secret plans to overthrow the republic and restore the monarchy. They planned to strike on the morning of January 7, 1895, but informers told the government about their plot. At dawn, as the queen's supporters slipped silently ashore on Waikiki, government soldiers opened fire. A few of the rebels fell dead or wounded; others surrendered. The government declared martial law. During the next few days, government troops defeated the disorganized rebels in a series of brief but deadly skirmishes. Within two weeks, they completely suppressed the uprising and captured its followers, including Queen Liliuokalani. The prisoners were tried for treason. Liliuokalani was forced to sign a document in which she finally renounced all claims to the throne. Now secure in its power, the republican government turned its attention to international relations and trade. In 1896, however, the election of a Republican, William McKinley, as president of the United States, rekindled Hawaiian hopes for annexation. President McKinley, like many Republicans, favored expansionism, and he welcomed the new annexation treaty. A joint resolution of Congress annexing Hawaii passed both houses, and the islands became American possessions. While Congress was considering the annexation treaty, an American fleet was steaming across the Pacific to attack the Philippine Islands. The United States had gone to war. about three weeks before it was blown up. The battleship Maine drifted lazily at its mooring. Although the Havana night was moonless, the Maine's gleaming white hull—longer than a football field—contrasted against the blackness of the sea and sky. Smoke wisped from its two mustard-colored funnels. Random lights sparkled from its portholes and its bridge. In the captain's cabin, Charles Sigsbee sat at a table writing a letter to his wife. The trouble in Cuba, he wrote, would soon be over. The new Spanish governor of the island seemed to have the situation under control. During the three weeks that the Maine had been in Havana, Captain Sigsbee had seen no sign of Cuban rebels. He'd entertained the Spanish officers in his mess, and he and his staff had been entertained lavishly by the local officials. Although Sigsbee found the bullfights to which he'd been invited somewhat barbaric, the Spanish officers behaved as perfect gentlemen. Even Fitzhugh Lee, the American consul, seemed optimistic. A month earlier the old general (Lee had commanded a cavalry division under his uncle Robert E. in the Civil War) had summoned a battleship to "protect American interests." Although the Maine was only a second-class battleship, it was the largest ship ever to enter Havana harbor. To the Cubans, it was a floating American fortress right in their capital city. Aboard the Maine, "taps" sounded at ten minutes past nine. Captain Sigsbee describes what happened next. I laid down my pen and listened to the notes of the bugle, which were singularly beautiful in the oppressive stillness of the night. . . . I was enclosing my letter in its envelope when the explosion came. It was a bursting, rending, and crashing roar of immense volume, largely metallic in character. It was followed by heavy, ominous metallic sounds. There was a trembling and lurching motion of the vessel, a list to port. The electric lights went out. Then there was intense blackness and smoke. The situation could not be mistaken. The Maine was blown up and sinking. For a moment the instinct of self-preservation took charge of me, but this was immediately dominated by the habit of command. Captain Sigsbee managed to reach the deck, now slanted down sharply toward the submerged bow. He climbed aft toward the only part of the ship that was not awash. Fires had broken out all over the vessel, and they lit the harbor in an eerie red glow. In Havana lights began to shine from windows that had just been smashed by the blast. Most of the crew had been asleep in their berths at the forward part of the ship, which was already at the bottom of the harbor. The stern sunk more slowly. 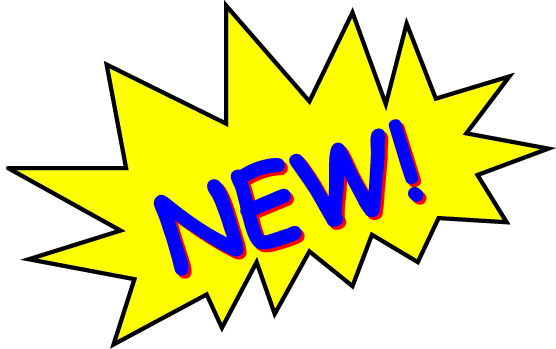 crew roster and much more. Crews from nearby ships manned lifeboats to rescue the surviving crewmen of the Maine. "Chief among them," Sigsbee wrote, "were the boats from the Alfonso XII. The Spanish officers and crews did all that humanity and gallantry could compass." Reluctantly, Captain Sigsbee abandoned the Maine, which continued to burn and explode throughout the night. The twisted, burnt wreckage of the Maine's stern and bridge was still above water in the morning. It remained there for years. Two hundred fifty-four seamen were dead, and fifty-nine sailors were wounded. Eight of the wounded later died. The navy conducted an investigation into the cause of the disaster, but it never discovered who was responsible for the explosion. The American press, however, had no doubts about who was responsible for sinking the Maine. It was the cowardly Spanish, they cried. William Randolph Hearst's New York Journal even published pictures. They showed how Spanish saboteurs had fastened an underwater mine to the Maine and had detonated it from shore. As one of the few sources of public information, newspapers had reached unprecedented influence and importance. Journalistic giants, such as Hearst and Joseph Pulitzer of the World, viciously competed for the reader's attention. They were determined to reach a daily circulation of a million people, and they didn't mind fabricating stories in order to reach their goal. They competed in other ways as well. The World was the first newspaper to introduce colored comics, and the Journal immediately copied it. The two papers often printed the same comics under different titles. One of these involved the adventures of "The Yellow Kid," a little boy who always wore a yellow gown. Since color presses were new in the 1890s, the finished product was not always perfect. The colors, especially the Yellow Kid's costume, often smeared. Soon people were calling the World, the Journal, and other papers like them "the yellow press." "They colored the funnies," some said, "but they colored the news as well." A minor revolt in Cuba against the Spanish colonial government provided a colorful topic. For months now the papers had been painting in lurid detail the horrors of Cuban life under oppressive Spanish rule. The Spanish had confined many Cubans to concentration camps. The press called them "death camps." Wild stories with screaming headlines—Spanish Cannibalism, Inhuman Torture, Amazon Warriors Fight For Rebels—flooded the newsstands. Newspapers sent hundreds of reporters, artists, and photographers south to recount Spanish atrocities. The correspondents, including such notables as author Stephen Crane and artist Frederick Remington, found little to report on when they arrived. Puck magazine published this cartoon depicting Cuba's difficult situation in the 1890s. "There is no war," Remington wrote to his boss. "Request to be recalled." Remington's boss, William Randolph Hearst, sent a cable in reply: "Please remain. You furnish the pictures, I'll furnish the war." Hearst was true to his word. For weeks after the Maine disaster, the Journal devoted more than eight pages a day to the story. Not to be outdone, other papers followed Hearst's lead. Hundreds of editorials demanded that the Maine and American honor be avenged. Many Americans agreed. Soon a rallying cry could be heard everywhere—in the papers, on the streets, and in the halls of Congress: "Remember the Maine! To hell with Spain." In the wake of the Maine incident, Congress hurriedly appropriated $50 million to prepare the nation for war. 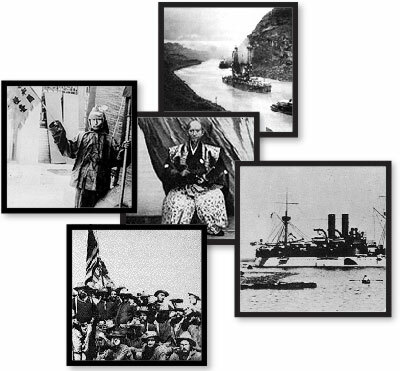 "Big navy" supporters, including the Assistant Secretary of the Navy, Theodore Roosevelt, appropriated the lion's share of the money. Next, President McKinley insisted that Spain agree to a cease-fire with the Cuban rebels and negotiate a permanent settlement with them. After a slight delay, Spain agreed to the American demands. Two days later, McKinley asked Congress for authority to use military force to end the Cuban conflict. Essentially, this was a declaration of war. The United States Army was not prepared for war. After the Civil War, the country had drastically reduced its army. Most army units had been scattered throughout the west, where they had fought and confined Native Americans. Volunteer and National Guard units quickly assembled in Tennessee. Regular-army divisions, filled with new recruits, rushed to Florida to await the invasion of Cuba. Back to the Pacific The navy, however, needed little preparation. The Pacific fleet was visiting Hong Kong when the news of war arrived. Commodore George Dewey quickly provisioned his ships and set off to attack the Spanish colony in the Philippine Islands. Photo of Commodore George Dewey. Once at sea, Commodore Dewey had his men paint all the ships. Once a bright white, the ships were soon covered with a dull gray to make them less visible to the enemy. Next, Dewey ordered that everything made of wood, including the piano on his flagship Olympia, be tossed over the side. Splintered wood presented a greater danger to his crews than enemy shells. Then with chests, chairs, and tables bobbing in the water behind them, the ships went after the Spanish fleet. After searching throughout an oppressive tropical night, Dewey found the Spaniards in the shallows of Manila Bay. At dawn on the first of May, the Olympia led the fleet in single file toward its enemy. The Spanish opened fire long before the Americans were within range. The Olympia moved still closer. When it reached effective range, it turned sharply to the west, bringing all its guns to bear upon the Spanish fleet. "You may fire when ready, Gridley," Dewey told his executive officer. With a deafening roar, the huge cruiser's guns erupted. The flagship swung around in a wide circle, and each ship followed, guns blasting as it passed. "We made five trips past the fleet," a gunner on the Boston wrote. Just two hours after the beginning of the battle we hauled out and, withdrawing a few miles, the order was given for breakfast. I was exhausted from the heat, loss of sleep, and lack of proper food. I went up on deck. Below the thermometer was at 116°, and the fresh air was a great relief. From this vantage point, I could see the destruction we had wrought. When the thick, black smoke that had obscured the battle cleared, he saw the Spanish fleet, battered and afire. The battle had been won. Eight seamen suffered wounds aboard the Boston (the same ship that had helped "liberate" Hawaii). One man died from the heat before the battle began. They represented the total casualties for the fleet. When the news of the stunning victory reached home, Americans cheered ecstatically. Dewey, "the conqueror of the Philippines," became an instant national hero. Stores soon filled with merchandise bearing his image. Few Americans knew what and where the Philippines were, but the press assured them that the islands were a welcome possession. Rough Riders Despite Dewey's early victory, the war in the Caribbean was getting off to a slow start. More than 250,000 soldiers rushed enthusiastically into the service. The army's quartermaster corps, however, had only fifty-seven men to supply the army with equipment. Soldiers gathered in Florida and waited impatiently for supplies and transportation. Some individuals organized and outfitted their own regiments. One such individual, the Assistant Secretary of the Navy, resigned his post and formed a volunteer regiment of cavalry. Teddy Roosevelt did not intend to miss his chance at glory. Roosevelt had been born forty years earlier to a wealthy New York family. He described himself as "a sickly, delicate boy" who "suffered much from asthma, and frequently had to be taken away on trips to find a place where [he] could breathe." Determined to overcome his physical limitations, Roosevelt embarked on a grueling program of body building. He practiced boxing, hunting, and riding, and after college he spent three years as a working cowboy in the wild Badlands of Dakota. "It was still the Wild West in those days," he wrote. "The West of the Indian and the buffalo hunter, the soldier and the cow-puncher." There he "led a free and hardy life with horse and rifle." Roosevelt's political career began in the New York legislature. Next, after running unsuccessfully for mayor of New York, he served as that city's police commissioner. A loyal Republican, he campaigned tirelessly for McKinley in the 1896 election, and the president rewarded him with an appointment to the Department of the Navy. Now, seeking again the "hardy life with horse and rifle," Roosevelt waited in Tampa with his men. His regiment, which called itself the Rocky Mountain Riders, consisted mostly of cowboys from the West, although it contained a few Indians and wealthy polo players from the East as well. The papers called the regiment "Teddy's Terrors," but its commander was Leonard Wood, a physician who was also a colonel in the regular army. Roosevelt served as lieutenant colonel. "Tampa was a scene of the wildest confusion," Teddy remembered. "There was no semblance of order." Thousands of men, horses, mules, and supply wagons were scattered about haphazardly in the tropical heat. Somehow the expedition reached Cuba. Still, "different parts of different outfits were jumbled together. . . . For instance, one transport had guns, and another had the locks for the guns. Soldiers went here, provisions went there, and who got ashore depended upon individual activity." Roosevelt, always active, got his regiment ashore quickly. "We disembarked with our rifles, our ammunition belts, and not much else," he remembered. "I carried some food in my pocket, and a light coat which was my sole camp equipment for the next three days." With the July temperature climbing above 100°, the soldiers plodded off through the thick jungle toward the city of Santiago. Wearing uniforms made of wool, the men struggled against the heat. Those who managed to obtain rations often discovered that their food had spoiled. Soon the ranks were riddled with malaria, fever, and dysentery. (Before the war ended, 5,200 Americans would perish from disease.) General Shafter, the army's commander, realized that if he didn't capture Santiago soon, he might not have an army left. After a few brief skirmishes, the armies confronted each other. The Spanish defended the San Juan hills, a long ridge east of Santiago. The Americans, arrayed in the valley below, sent up an observation balloon to study the city's defenses. Roosevelt, who had managed to obtain a horse, rode up and down the lines anxiously. "I had come to the conclusion," he said, "that it was silly to stay in the valley firing up at the hills. . . . The thing to do was to try to rush the entrenchments." Never a man to stand on ceremony, Teddy took it upon himself to order the charge. With a pistol in one hand an a saber in the other, Teddy spurred his mount forward. His face grew flushed; his glasses clouded with steam; a wide grin covered his face. The rough riders followed on foot, and the Ninth Cavalry, an African American regiment, rushed forth beside them. As he reached the crest of Kettle Hill, Teddy saw its defenders fleeing before him. He fired at one of them, and later remarked that the man fell "as neatly as a jackrabbit." Atop Kettle Hill, the soldiers dined on captured Spanish provisions. Later Teddy left his men and rode to the top of San Juan Hill, but the Tenth Cavalry, another African American regiment, had already stormed and captured it. That night the Americans repelled a Spanish counterattack. In the morning, General Shafter demanded that the Spanish commander surrender. A Big Turkey Shoot Ramon Blanco y Erenas, governor general of Cuba, received Shafter's demand. He responded by ordering his fleet to attack the American ships blockading Santiago harbor. If the Spanish could destroy the Americans' supply line, he thought, they could force the enemy to withdraw. His fleet commander, Admiral Cervera, disagreed. Attacking a force four times the size of his own seemed like suicide. Nevertheless, Cervera obeyed his orders, and in the hazy dawn the Spanish, led by the magnificent Maria Teresa, bravely steamed into battle. The Americans were ready. Four first-class battleships (any one of them might have been a match for the whole Spanish fleet), two cruisers, and several smaller ships enclosed the mouth of the harbor in a half-circle. Tugboats filled with reporters scurried in their wake. The Oregon fired the first shot of the battle, and soon black smoke blurred the bay. "It was a big turkey shoot," Seaman Cross of the Oregon said. "The Fleet came out and went to Davy Jones' locker." By one o'clock the battle was over. The Spanish fleet was destroyed, and with it sank all hope of victory in Cuba. General Nelson Miles, the old Indian fighter, led a force to Puerto Rico. He conquered the island and its few Spanish defenders easily. In effect, the war was over. Spain agreed to an armistice. In the four months of fighting, Americans had lost a total of 460 soldiers in battle. Compared to the Civil War, in which tens of thousands were often killed in a single day, these casualties seemed insignificant. "It's been a splendid little war," the ambassador to England wrote to his friend, Teddy Roosevelt. Roosevelt returned, the hero of the war. Because of his heroism on Kettle Hill, he'd been nominated for the Congressional Medal of Honor. His popularity swept him to the governorship of New York. Like Dewey before him, Roosevelt memorabilia filled shop windows. One of the more popular items was a cuddly stuffed animal wearing a bandana and glasses. People called it the "Teddy Bear." In the months following the Spanish-American War, the winds of expansionism blew strongly across the United States. There was a lot of talk about "Manifest Destiny," and many people suggested that America should assume its role as a world power. In Congress, legislators called for the annexation of all Spanish territories. Some newspapers even suggested the annexation of Spain itself. Expansionists such as Roosevelt, former President Harrison, and Captain Mahan argued for creating an American empire. Others, including Grover Cleveland, Andrew Carnegie, and Mark Twain, opposed these ideas. In October, representatives from Spain and the United States sat down in Paris to work out a treaty. President McKinley appointed a "peace commission" to represent the United States. A majority of the commission's members believed in expansionism. No representatives from the colonies whose fates were being decided attended the Paris conference. Commodore Dewey wrote to his superiors and pointed out that the Filipinos seemed better prepared for self-government than the Cubans did. The War Department responded by sending more men and equipment to Manila. Emilio Aguinaldo, the wiry leader of the Filipino independence movement, felt betrayed. Aguinaldo admired the United States. He liked to be called "the George Washington of the Philippines." He had helped the Americans fight the Spanish. Now the Americans and the Spanish residents of the islands were fighting him. Aguinaldo led his bitter troops into the jungles, and for three years they fought a brutal war against the military government. In the end the overwhelming power of the American forces defeated them. The Americans confined many Filipinos in concentration camps like the ones the Spanish had used in Cuba. William Howard Taft was appointed head of the Philippine Commission, charged with replacing the military government with a civilian legislature. Despite the plan to prepare the Philippines for independence, however, Americans continued to rule the islands until after World War II. The war in the Philippines claimed four times as many American lives as the war with Spain did. Few Americans, however, rejoiced at the victory. There were no heroes. No parades greeted the returning troops. For many, this war seemed to contradict some basic American values. "I have been criticized a good deal about the Philippines," McKinley said, "but I don't deserve it. The truth is . . . they came to us as a gift from the gods." "Congratulations," Andrew Carnegie wrote to a leading expansionist. "You seem to have about finished your work of civilizing the Filipinos. It is thought that about eight thousand of them have been completely civilized and sent to heaven. I hope you like it." 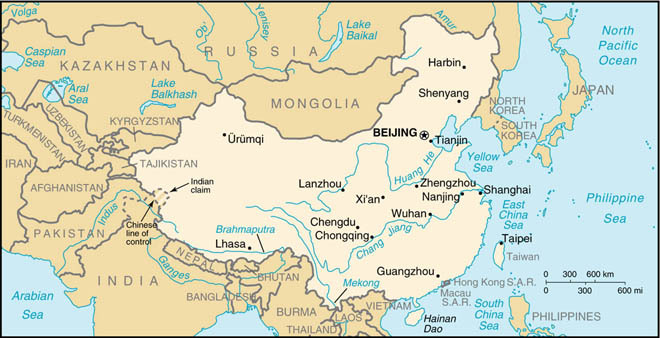 Austria, France, Germany, Great Britain, Italy, Japan, and Russia all claimed exclusive trading rights to certain parts of China. They were dividing China into "spheres of influence." Some even claimed to own the territory within their spheres. By acquiring the Philippines, the United States became an Asian power too. Now, with a strong base of operations just 400 miles from China, American businesses hoped to take advantage of China's vast resources. The foreign spheres of influence, however, threatened their ambitions. So while the empress was hoping to close China to foreigners, Americans were looking for a way in. John Hay, now Secretary of State, had an idea. Since public opinion, strained by the Philippines war, would never support the use of force, he decided to negotiate. He sent letters to all the foreign powers and suggested an "Open Door" policy in China. This policy would guarantee equal trading rights for all and prevent one nation from discriminating against another within its sphere. In northern Shandong province, a devastating drought was pushing people to the edge of starvation. Few people there were thinking about making peace. A secret society, known as the Fists of Righteous Harmony, attracted thousands of followers. Foreigners called members of this society "Boxers" because they practiced martial arts. The Boxers also believed that they had a magical power, and that foreign bullets could not harm them. Millions of "spirit soldiers," they said, would soon rise from the dead and join their cause. Their cause, at first, was to overthrow the imperial Ch'ing government and expel all "foreign devils" from China. The crafty empress, however, saw a way to use the Boxers. Through her ministers, she began to encourage the Boxers. Soon a new slogan—"Support the Ch'ing; destroy the foreigner! "—appeared upon the Boxers' banner. advanced in a solid mass and carried standards of red and white cloth. Their yells were deafening, while the roar of gongs, drums and horns sounded like thunder. . . . They waved their swords and stamped on the ground with their feet. They wore red turbans, sashes, and garters over blue cloth. [When] they were only twenty yards from our gate, . . . three volleys from the rifles of our sailors left more than fifty dead upon the ground. Because it had participated in the campaign, the United States participated in the settlement that followed. Hay called for an expanded "Open Door," not only within the spheres of influence, but in all parts of China. He also recommended that the powers preserve China's territory and its government. Other powers agreed, and the Open Door policy allowed foreign access to China's market until World War II closed it once again. The popular acclaim that carried Teddy Roosevelt to the governorship of New York didn't stop there. In 1900, Republicans nominated Teddy as President McKinley's running mate. McKinley won a second term, and Teddy was sworn in as vice-president. Six months later, an assassin's bullet killed McKinley. At age 42, Theodore Roosevelt became the nation's youngest president. Roosevelt assumed the office with the same vigor with which he charged up Kettle Hill. A long believer in Captain Mahan's theory of sea power, Roosevelt began to revitalize the navy. Now that America's empire stretched from the Caribbean across the Pacific, the old idea of a canal between the two oceans took on new urgency. Mahan had predicted that "the canal will become a strategic center of the most vital importance," and Teddy agreed. "The canal," Roosevelt said, "was by far the most important action I took in foreign affairs during the time I was President. When nobody could or would exercise efficient authority, I exercised it." In 1878 Ferdinand de Lesseps, the French engineer who built the Suez Canal, began to dig a canal across the Isthmus of Panama, which was then part of Colombia. Tropical disease and engineering problems halted construction on the canal, but a French business (the New Panama Canal Company) still held the rights to the project. Roosevelt agreed to pay $40 million for the rights, and he began to negotiate with Colombia for control of the land. He offered $10 million for a fifty-mile strip across the isthmus. Colombia refused. "We were dealing with a government of irresponsible bandits," Roosevelt stormed. "I was prepared to . . . at once occupy the Isthmus anyhow, and proceed to dig the canal. But I deemed it likely that there would be a revolution in Panama soon." Teddy was right. The chief engineer of the New Panama Canal Company organized a local revolt. Roosevelt immediately sent the battleship Nashville and a detachment of marines to Panama to support the new government. The rebels gladly accepted Roosevelt's $10 million offer, and they gave the United States complete control of a ten-mile wide canal zone. Roosevelt ordered army engineers to start digging. Thousands of workers sweated in the malarial heat. They tore up jungles and cut down mountains. Insects thrived in muddy, stagnant pools. "Mosquitoes get so thick you get a mouthful with every breath," a worker complained. The mosquitoes also carried yellow fever, and many fell victim to the deadly disease before Dr. William Gorgas found a way to stop it. Some Americans did not approve of Roosevelt's behavior. "There was much accusation about my having acted in an 'unconstitutional' manner," Teddy shrugged. "I took the isthmus, started the canal, and then left Congress—not to debate the canal, but to debate me. . . . While the debate goes on, the canal does too; and they are welcome to debate me as long as they wish, provided that we can go on with the canal." Work did go on. Despite lethal landslides, workers with dynamite and clumsy steam shovels cut their way across a continent. They built a railroad, three sets of concrete locks, and a huge artificial lake. Nine years later the freighter Ancon entered the new channel. Hundreds of construction workers hopped aboard for the historic ride. A shiny towing locomotive pulled the Ancon into the first lock. Bands played and crowds cheered as the ship slipped into the Pacific. Roosevelt liked to repeat an old African saying: "Speak softly, and carry a big stick. You will go far." In Panama, Teddy proved to the world that he was willing to use his big navy as a stick to further American interests. Republic was another site of U.S. intervention in the early 1900s. Between the end of the Spanish-American War and the dawn of the Great Depression, the United States sent troops to Latin American countries thirty-two times. It used the Roosevelt Corollary, or addition, to the Monroe Doctrine to justify intervention. In the corollary, Teddy Roosevelt proclaimed that the United States, because it was a "civilized nation," had the right to stop "chronic wrongdoing" throughout the Western Hemisphere. "Any country whose people conduct themselves well can count upon our hearty friendship," he said. "Chronic wrongdoing, however, . . . may force the United States to exercise an international police power." Teddy didn't hesitate to use this "police power" to strengthen his country, but he was always careful not to upset the balance of world power. William Howard Taft, former governor of the Philippines, followed Roosevelt into the White House. Taft believed in economic expansion, and he introduced a policy called "dollar diplomacy." This policy used diplomacy to advance and protect American businesses in other countries. Taft employed Roosevelt's corollary in Nicaragua and other Latin American countries to protect American investments. American businesses had been active in Nicaragua since the 1850s. The lush country attracted American fruit growers and mining companies. Others believed that Nicaragua offered the best site for a canal, and they invested in land. Cornelius Vanderbilt started a company that transported passengers between New York and San Francisco via the Nicaraguan jungle. Shortly after Commodore Perry opened Japan, Vanderbilt plotted to take control of Nicaragua. With Vanderbilt's help, a young adventurer named William Walker set out with fifty-seven followers to conquer Nicaragua. A short, freckled man with sharp green eyes, Walker formed an alliance with a group of local rebels and defeated the Nicaraguan forces. He proclaimed himself "commander in chief," and soon thousands of Americans rushed into the country. Many Americans wanted the United States to assume direct control of Nicaragua. The government, however, was afraid to upset the fragile balance between "free" and "slave" territories. Walker eventually quarreled with Vanderbilt about the transit company, and soon another revolution drove him from power. In 1860 Walker died before a firing squad. American economic involvement in Nicaragua lived on. Nicaraguans confidently expected the canal, and they gladly accepted loans and payments based on its eventual construction. By 1909 the United States-Nicaraguan Concession was largest American company in Nicaragua. That year the Concession's chief legal counsel, Philander C. Knox, resigned to become Taft's Secretary of State. When Nicaragua's ruler cancelled an agreement with one American business and threatened the Concession, the company organized another revolution. Adolfo Diaz, a Concession employee, became the new president. Taft quickly recognized the Diaz government. When still another revolt threatened Diaz, Taft invoked the corollary and ordered American marines to suppress the rebellion. Then he and Knox worked out a plan to collect the money that Nicaragua owed to foreign investors. Under the plan, American banks took control of Nicaragua's customs collection. They applied the money they collected directly to the country's debt. The marines remained in Nicaragua's capital to serve as "international police" and prevent any further revolts. Except for a short period in 1925, they stayed for 21 years. The two decades that sandwiched the turning of the century enclosed a turning point in American history. Despite George Washington's advice to the contrary, the years saw American interests scatter across the globe. America had flexed its muscles, and the world had cowered. But the ease with which America gained its new possessions obscured the responsibilities that came with them. Dollar diplomacy would soon drag a reluctant America into the muddy trenches of the Western Front. The "Open Door" welcomed a series of squabbles that later erupted in a mushroom cloud. But few in that innocent era could foresee such extraordinary events. Most believed that America was simply following its natural order, its destiny.